Born Frans Nicholas Meijer in Amsterdam, by the age of 14 he was working as a gardener's assistant at the Amsterdam Botanical Gardens under the direction of the eminent botanist Hugo de Vries. During his eight years at the garden, interrupted in his nineteenth year for mandatory military service, he rose to Head Gardener in charge of the experimental garden. Gripped by an overwhelming wanderlust, Frans Meijer wanted to see the gardens and plants of Western Europe, so he set out on a personal journey of discovery - on foot. He traveled through Belgium, Germany France, Switzerland, Italy, and to Spain to see the orange groves, and eventually back home - if such a lost soul can ever be said to have a home. "I am pessimistic by nature, and have not found a road which leads to relaxation. I withdraw from humanity and try to find relaxation with plants. I live now in expectation of what will come." - October 11, 1901 letter to a friend. He travelled to England and found work in a commercial nursery near London, but was soon to feel the need to travel again. He boarded the S.S. Philadelphia, and sailed for New York in October 1901. Hugo de Vries had seen great potential in this young man, and had helped him gain an education in French and English, and the sciences, all in hopes of inspiring young Frans to settle down to a promising career as a botanist. Although that was never to be, his education did prove immensely valuable, as he was able to find work in Washington at the greenhouses of the U.S. Department of Agriculture. During the next four years he visited Mexico, California and Cuba, and as always, he travelled alone, working in nurseries to pay his way. It was the plant collector David Fairchild who saw the greatest potential in Frank Meyer, and asked him to travel to East Asia in search of plants of economic value for the USDA. He was introduced to Charles Sargent and instructed carefully on what plants had already been discovered, so he could avoid unnecessary duplication. At one time or another, both Sargent and Fairchild had planned to travel to China with him, but circumstances prevented it, and Meyer went to China alone. His first expedition (1905-1908), which took him from Shanghai to Hupeh, Manchuria and back, again was a productive one. He shipped back specimens of Diospyros kaki, the Chinese persimmon, larger and generally more marketable than the native American species, and Diospyros lotus, its wild cousin used by the Chinese for grafting the cultivated varieties. 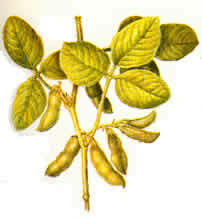 Other plants from his first expedition included Juniperis chinensis 'Columnaris', Catalpa bungei, Aesculus chinensis - the Chinese horsechestnut, and Ginkgo biloba. 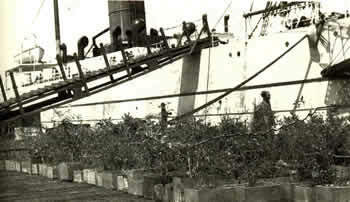 The many shipments he mailed back to the United States also included thousands of seeds from Chinese vegetable crops. His next three expeditions (1909-11, 1912-15 and 1916-18) would be equally productive. He explored as far west as Russian Turkestan and east into Manchuria, Korea and Kansu, and collected tens of thousands of specimens, which represented approximately 2500 plant introductions. Among them were many notable crops such as soybeans, new types of grain, fruit, vegetables, bamboos, Chinese cabbage, elms, bean sprouts, bamboo shoots and water chestnuts. He also introduced to western cultivation many notably ornamental plants like Syringa meyeri, Juniperus squamata var. meyeri, Ulmus parvifolia, Ulmus pumila, Pyrus calleryana, Castanea mollisima, Rosa xanthina and Pistacia chinensis. By 1918 the political situation in China had deteriorated to the point where travel of any kind was dangerous, if not impossible. Frank Meyer, who by all accounts was planning to return to America, sailed down the Yangtze River to Shanghai May 28th 1918, but died on route under mysterious circumstances.